This year is slowly coming to an end, and with only 3 months left of the year I decided it was time to reflect and to set up some goals that are within reach for the end of the year. Since most of these goals actually have to do with my online presence, I thought I would share them with you, and maybe you will want to set up your own goals for these last 3 months of 2017. Now this is something I'm not 100% sure is in reach, but I will do my absolute best to get an apartment and move to England in November. I really hope it works out. For 2017, one of my new year's resolutions was to read 15 books. It might not be a lot, but I haven't been reading a lot the past few years so I decided if I actually managed to read 15 books this year I would maybe get into reading books again. Well, I've read 9 books so far, so that leaves 2 a month now for the end of the year. And that's doable. I've been stuck around the 1,080 mark for about 2 years. I hit 1,000 followers and then it just kind of stopped. So, before the end of the year I want to gain around 20 followers. While I can honestly say that I don't really care about followers, I will be honest and say that it's been annoying to be stuck on the same number for so long and since I want to grow my blog and my youtube, it's hard if I'm stuck on the same number on other social medias, because to grow your blog you have to grow your following (most of the time). 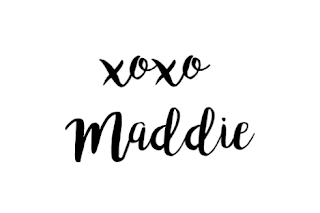 I'd love it if you hopped over to http://twitter.com/itsmaddiehbu and click that "follow" button. And if you tweet me, I will of course follow back! And maybe we can be friends, who knows? Similarly to Twitter, I've been stuck on the same number of followers for so long. I have 217 followers, and I've been around that follower count for about a year. So it would be nice if you went over to http://instagram.com/itsmaddiehbu and clicked that "follow" button, and I will make sure to follow you back! It can be your early Christmas gift to me. Also, I'm going to start posting a lot more on there, so stay tuned for that! Now I'll be the first to admit that I've been absolutely horrible at blogging the last few years. I've posted inconsistently and I don't want it that way anymore. While I'm not yet setting up a schedule and deciding to post on a certain day, I want to make sure that I post at least once a week. And once I manage to post once a week, I can then make a schedule for myself. But I know myself too well to say "I'll post every Wednesday and Saturday", because I know I'll fail if I do that. So, I'm keeping it casual, but willing myself to post at least once a week. I've also ordered a DSLR camera and with that I hope to get better pictures for my blog (and Instagram). If I've been horrible at blogging, my Youtube channel has suffered even more. I want to start filming more for my Youtube channel and I want to find a love for doing it again. And with a new camera (and a tripod!!) on their way to my house as we speak, the quality will also be a lot better. And I can finally start filming things my current camera hasn't allowed me to film. So, stay tuned for that! I want to part-take in bloggers chats, BUT I JUST FORGET THAT THEY'RE HAPPENING. I need to make some kind of list of all the bloggers chats, and put it up right in front of my laptop so I see it at all times, then maybe I'll remember. So, if you know of a bloggers chat, tweet me at what time it happens so I can join in! I think when the colder months come, many of us just give up on staying active, because we don't need a "bikini body" during the colder months (also, Christmas chocolate!!). But I don't want to do that this year. I want to stay active and at least go for walks, if nothing else. I want to get back into a workout routine, because recently I've really been slacking off. So I want to be active, and stay active. That's it, that's my goals for the end of the year! Will I manage to reach all goals? Probably not, but they're guidelines for what I want. These are some great goals. I really hope that you achieve them.